The 12.3 acre Crystal Cove Historic District is a well-preserved example of Southern California vernacular beach architecture and terrain. The District retains the scale and ambiance of a 1930’s beach resort. “Crystal Cove” was named in 1927 by Elizabeth Wood “because the name seemed right for such a beautiful place.” The site was always a favorite spot of the owners James Irvine II and James Irvine III, who spent much time enjoying the beach setting. They generously allowed employees and friends to build small shelters and cottages along the beach and against the bluffs. During these years, the cottages were close to the creek that drained Los Trancos Canyon. Tents were pitched on the beach. A parking area for cars was developed at the foot of the canyon. Sometime in the 1920’s, a lumber ship capsized and wood suitable for construction of more cottages drifted ashore. It became a tradition for many families who had enjoyed the Cove since the 1920’s to return to this favored place each summer. The Irvine Family had been generous with permission for the construction of the cottages that still line the beach today, virtually unchanged. In the late 1930’s, as the cottage owners made improvements and lengthened their stay, the Irvine Family decided that those with cottages must make a choice. They were invited to either move their cottages elsewhere or to relinquish ownership and lease their cottages from The Irvine Company. This short term leasing system actually served to preserve Crystal Cove in its original form since the leases specified that no dimensional changes could be made to the cottages. This single act ensured that the area appears much as it did in the 1920’s with the exception of the absence of seasonal visitors who are no longer allowed to pitch tents on the beach. In the mid-seventies, Martha Padve learned of the California State Parks’ interest in acquiring Crystal Cove. Mrs. Padve and her husband had been weekend residents of the Cove for nearly 20 years. Her interest in historic preservation in her home town of Pasadena led her to explore placing Crystal Cove on the National Register of Historic Places, thereby saving the cottages for future use. With the help and advice of another Cove resident, historian Christine Shirley, and of Elsa Burns, a preservationist from San Juan Capistrano, Mrs. Padve researched the early history of Crystal Cove and its resident community. She wrote a successful proposal adopted by members of the State Historical Commission, who recommended it for National Register status. Crystal Cove Conservancy is the non-profit cooperating association benefiting the Crystal Cove State Park Historic District. On April 5, 2006, Crystal Cove Conservancy was awarded a concession contract by California State Parks to manage the overnight rentals and food service in the Crystal Cove Historic District. This is the first time in California State Parks history that a non-profit cooperating association has been awarded a concession contract. Having a non-profit manage the concessions means that a greater amount of revenue will benefit Crystal Cove State Park. In order to provide an excellent experience for our guests, Crystal Cove Conservancy formed Crystal Cove Beach Cottages, a wholly owned subsidiary of the non-profit. 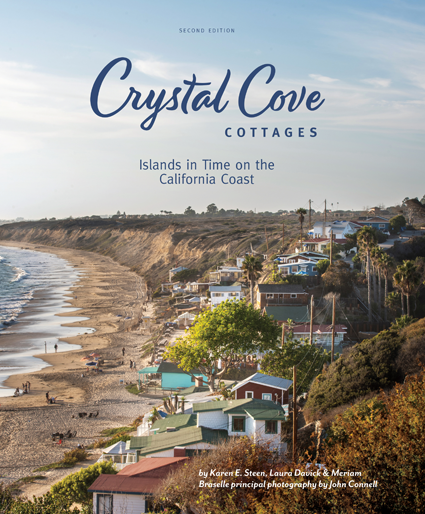 Creating Crystal Cove Beach Cottages to manage the concession operations allows the Crystal Cove Conservancy to focus on its mission of renovation and preservation in the Crystal Cove Historic District while providing the best visitor experience possible. Located in the heart of Crystal Cove State Park’s 3.5 miles of pristine coastline, the Historic District first developed as a South Seas movie set due to its seclusion and tropical aura. The community thrived and became beloved for its relaxed, friendly atmosphere and picturesque landscape, and in 1979, the Crystal Cove Historic District was placed on the National Register of Historic Places. We invite you to experience the magic of Crystal Cove as it existed from the 1930s to 1950s with a stay in one of 11 Individual or 3 Dorm-style Cottages. Located directly on the beach or overlooking it from a bluff top, each cottage has been painstakingly restored and furnished to recreate Crystal Cove’s unique historic beach culture and ambience. Reservations are available year-round. Each cottage and room at Crystal Cove Beach Cottages is unique, so there is no such thing as a “typical” cottage or room. Please choose accommodations carefully since during peak periods we will not be able to accommodate requests to change to another unit as there is a very limited number of cottages and rooms. The Crystal Cove Historic District is a 12.3-acre coastal portion of the 2,791-acre Crystal Cove State Park. The federally listed Historic District is an enclave of 46 vintage rustic coastal cottages originally built in the 1920’s and 1930’s nestled around the mouth of Los Trancos Creek. It is one of the last remaining examples of early 20th century Southern California coastal development.